Many of us get inspired by the people who are becoming successful on YouTube, and we may also feel confident that we have the skills to become successful like these people. But before starting a YouTube Channel, you must consider the following things. 1. Understand why you are going to create a YouTube Channel. 2. Some people want to make money or some people take this up as a hobby. Understand the purpose and be clear in your expectations. 3. YouTube Channel can be helpful in driving more traffic to your website. 4. If you are looking for monetary benefits remember, you cannot make quick money from YouTube channels. 5. Before you start, learn how to use YouTube. 6. Learn about the copyright laws and infringement or violating the YouTube laws. 7. Learn how to upload videos and also how to delete them. 8. Set a goal so that you will work hard to reach the goal. 9. Decide on what you are going to make videos. 10. Choose the niche you are interested in. 11. Know from where your viewers will come. 12. Find the target audience and find the interest of the potential viewers. 13. Understanding the target audience helps in making relevant content for them. 14. Choose the topic you are passionate about. 15. Positive attitude is necessary and keep on looking on the bright side. 16. Be unique and make the channel stand out. 17. Let the content of your YouTube channel be original. 18. Find out about competitors in that niche. Research and find which of the YouTubers are serving the same to the audience. 19. YouTube channel building depends on how often you are going to post the content. 20. Decide how often you are going to upload them, is it weekly, two times in a week or once in every two weeks. 21. In what format you are going to make the videos. 22. Another thing to consider is to with what you are going to shoot the videos. Are you going to use the video camera, phone or the web cam. 23. Depending on the type of videos you are going to make you might need to invest in some video making equipment. 24. Decide how much time you can spend on YouTube efforts. 25. For the success of the YouTube channel, you need to create the videos, promote them, build subscriber base and also interact with the viewers. You need to have time to do all these things. 26. The success of any YouTube channel takes a lot of time. You need to have patience for this. 27. Have goals to measure the success. 28. Before deciding to make your first video for YouTube channel, you need to see whether you have the writing skills to write script for the videos. 29. The strategy to attract more customers needs to be planned before starting YouTube channel. 30. Video attract at least three times more views than a normal blog post. So take advantage of this. 31. The key to success on YouTube is consistency. Offering good quality video is necessary and for this you will need to invest in video production equipment and also on video editing. 32. YouTube can help you to get into limelight. Consider whether you are comfortable or not before the camera. 33. Make sure that you have good quality videos that entertain and are useful to the viewers. 34. Do not compare yourself with other YouTubers. 35. Only get inspired by other popular YouTube videos but never feel disheartened because you do not have the similar number of views and subscribers. 36. Watch the videos, television show or even movies to learn new techniques and get new ideas. 37. Don’t worry about the camera you are having. Choose either a camera or a camcorder that provides audio and image stabilization. 39. Use simple video editing software so that you don’t get confused. 40. One of the toughest parts of starting a YouTube channel is to come up with a good name. 41. Remember, high quality videos with good content get more views and shares. 42. Think of ways to reach your target audience. 43. Create a page for Your YouTube channel on social sites such as Facebook. 44. Relationship with audience is important for success of YouTube. 45. Be ready to face negative comments from viewers. 47. Getting initial attention for the videos is very difficult and to make things easier post a video response to a popular video. 48. Choose popular types of videos such as product reviews to get quick response in the initial stages. 49. Use apt tags when uploading videos. 50. Don’t spam to get attention on YouTube. 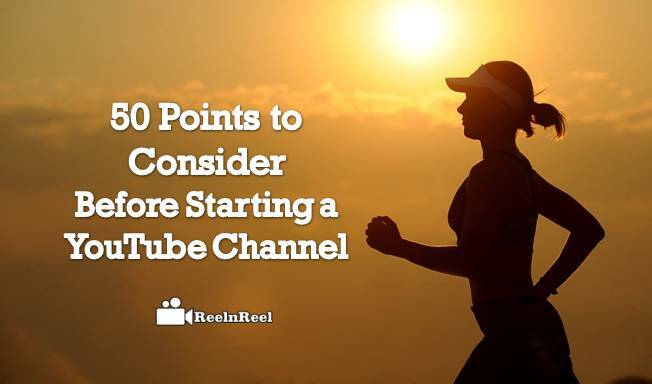 The above are few things to consider before you launch a YouTube channel. Creativity and talent are needed to make the YouTube channel a great success.